Read most art histories and you might come away with the impression that Western painting in the first few decades of the twentieth century was all about Cubism and other routes to Modernism. In fact there were still many fine and original paintings being produced by artists who preferred to develop their Post-Impressionist styles rather than abandon the past and compete with Picasso and Matisse. 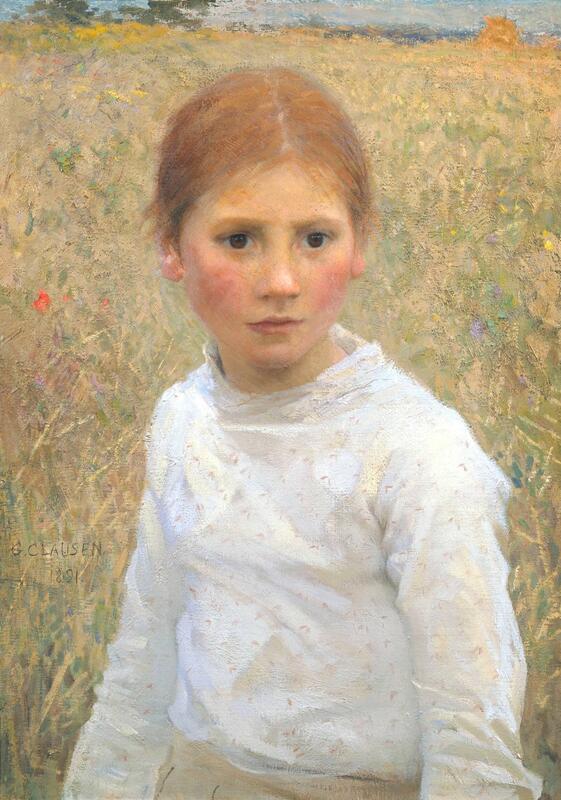 Sir George Clausen (1852–1944) is a particularly interesting example, as his work developed from rural naturalism, through Impressionism, to a distinctive Post-Impressionist style. His later paintings, in particular, use light and colour to create a wonderful atmosphere. He was also active at a crucial period in British farming, as many of its traditional practices were being replaced by powered systems, transforming the countryside and its communities. Clausen was part Danish, being the son of an interior decorator from Denmark, and part Scottish from his mother. Born and brought up in London, he was apprenticed to a London firm of decorators at the age of 14, and worked in their drawing office. He attended evening classes in South Kensington, London, at the Government Art Training School (which later became the Royal College of Art), where he obtained his art teacher’s certificate in 1877. During this period he also visited France, Belgium, and the Netherlands; while he was in France he studied under Bouguereau and Robert-Fleury. His early works, during the 1870s, were rather undistinguished landscapes after the Hague School, and cityscapes of his London surroundings. But these gave him a taste for life in the country, and when he married in 1881, the couple moved out to Childwick Green in what was then rural Hertfordshire. From there he visited France, painting in the artists’ colony of Quimperlé, where he first became familiar with painting en plein air. 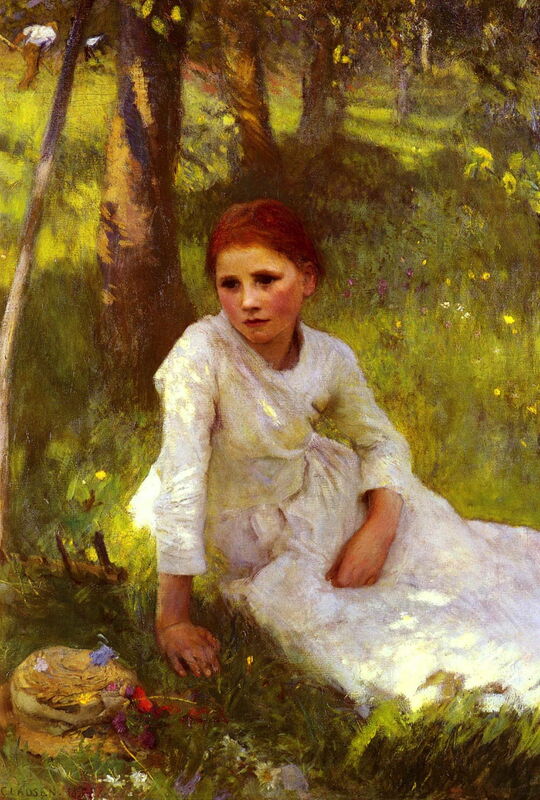 Sir George Clausen (1852–1944), Day Dreams (1883), oil on canvas, 70 x 152.5 cm, Private collection. Wikimedia Commons. It was at Childwick Green that he started to paint realist scenes of the countryside, particularly of its many manual workers. Following the lead of Jean-François Millet, and under the more contemporary influence of Jules Bastien-Lepage and Léon Lhermitte, his peasants were not romanticised but gritty and wrinkled. Among his more successful paintings of this period is Day Dreams (1883), which is also one of his earliest works to show a particular interest in light and colour. Determined to reform the selection process of the Royal Academy of Arts in London, he was a founder-member of the New English Art Club (NEAC) in 1885, and became its most widely-respected member. He moved to St Albans, Hertfordshire, for a time in 1884. Sir George Clausen (1852–1944), Bird Scaring (1887), oil on canvas, 123.2 x 94 cm, Private collection. Wikimedia Commons. Bird Scaring (1887) is an excellent record of one of the army of children who were sent out into the fields with noise-making devices, such as the slabs of wood shown here, to scare scavenging birds away from the fields. The boy’s tattered clothing and makeshift gaiters are typical of dress among the rustic poor of the day. 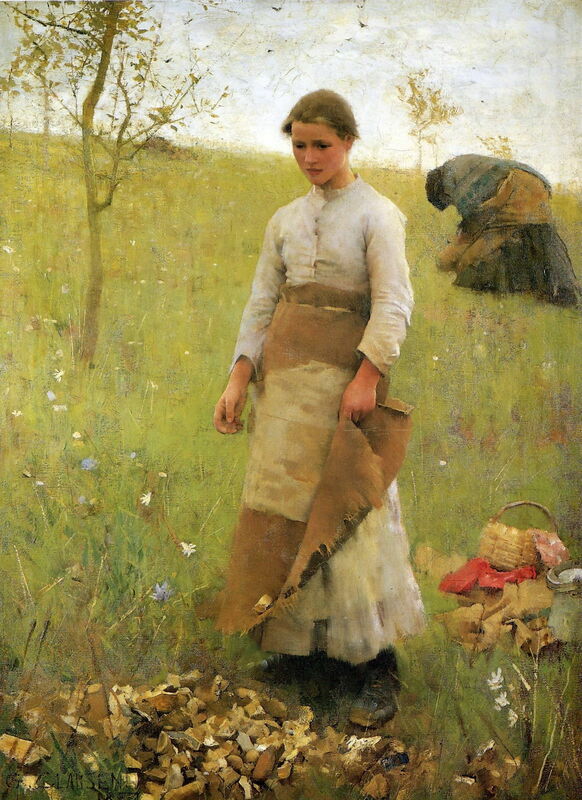 Sir George Clausen (1852–1944), The Stone Pickers (1887), oil on canvas, 107.6 x 79.2 cm, Laing Art Gallery, Newcastle upon Tyne, England. Wikimedia Commons. The Stone Pickers (1887) shows another lost rural occupation, of picking up stones from agricultural land to improve it, and to make it easier to work with machines. 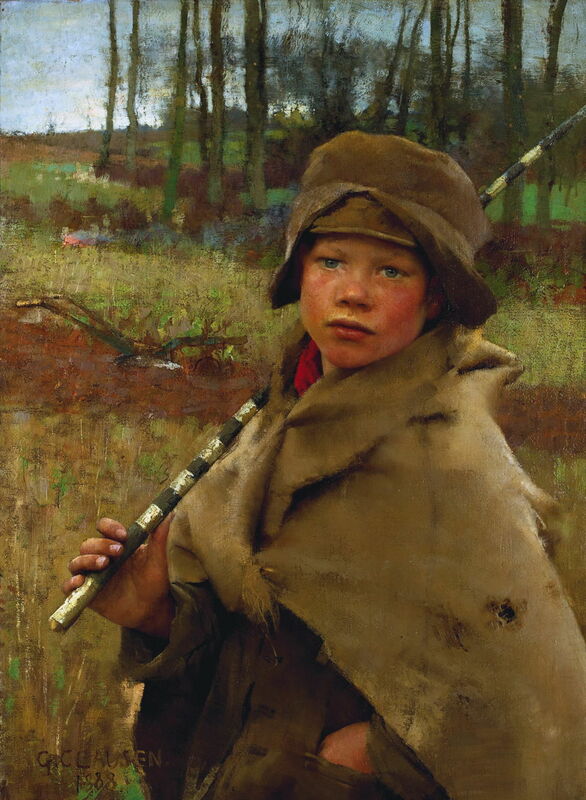 Sir George Clausen (1852–1944), A Ploughboy (1888), oil on canvas, 76 x 56 cm, Private collection. Wikimedia Commons. 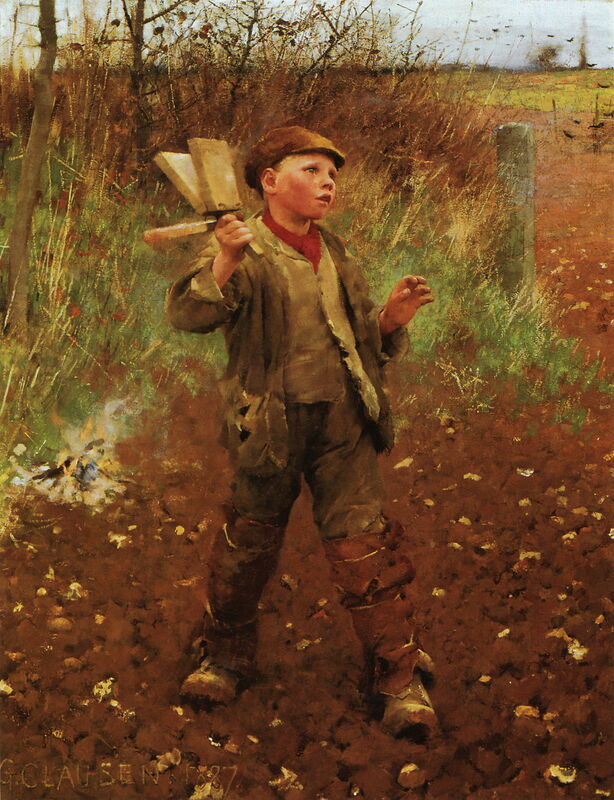 A Ploughboy (1888) was shown at the Grosvenor Gallery (the NEAC exhibition venue) in 1888, where it was enthusiastically received as “the high water mark of realism”. There is also a smaller study for this painting, which is far more gestural and may have been sketched en plein air. Ploughboys were required to lead the team of horses which pulled ploughs through the land, and this boy’s plough is shown in the background. In the late 1880s, he moved to Cookham Dean in Berkshire, where one of his favourite models was a local woman, Mary Baldwin, who also worked as the family’s nanny. 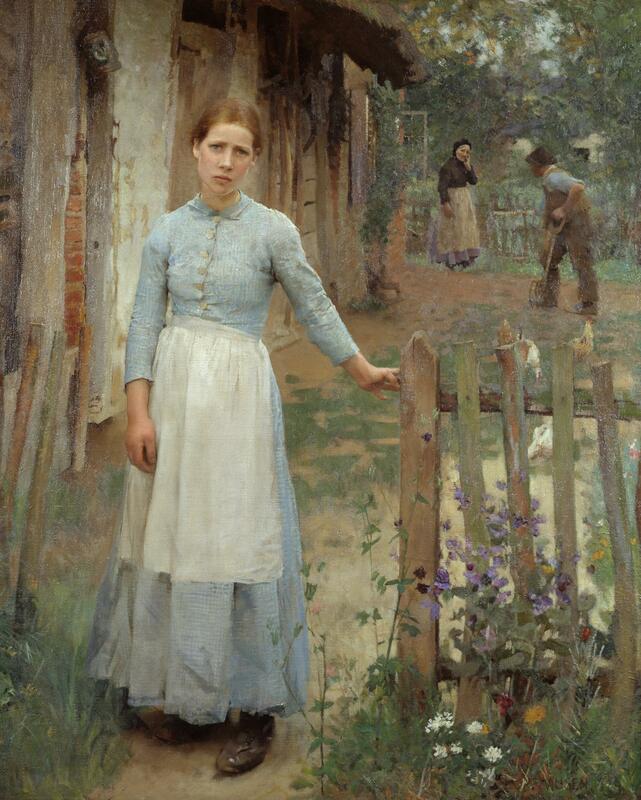 She is the woman in the foreground of his The Girl at the Gate (1889), which shows strong influence by Bastien-Lepage. Brown Eyes (1891) shows another of his favourite local models, Rose Grimsdale, also from the village of Cookham. At this time he was under contract to Goupil’s London office. In that same year, he moved to Widdington in Essex, where he re-evaluated his painting style. As a result, throughout the rest of the 1890s he used increasingly intense colour and light. Sir George Clausen (1852–1944), Noon in the Hayfield (1897), oil on canvas, 117 x 85 cm, Private collection. Wikimedia Commons. 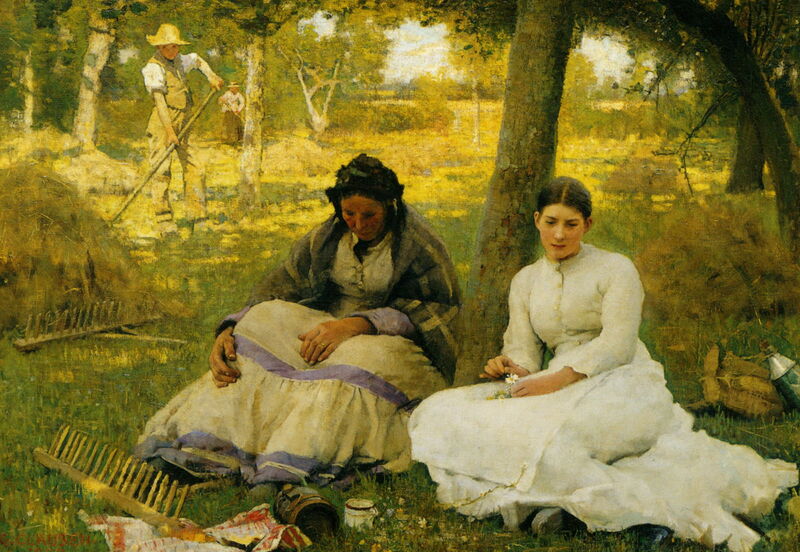 Noon in the Hayfield (1897) had evolved in studies and other paintings over the period 1892-7, and demonstrates his transition to Impressionism. The next and concluding article will look at Clausen’s mature style, and how that evolved after 1900. Posted in General, Painting and tagged Bastien-Lepage, Clausen, Impressionism, landscape, Lhermitte, Millet, painting, Post-impressionism. Bookmark the permalink.